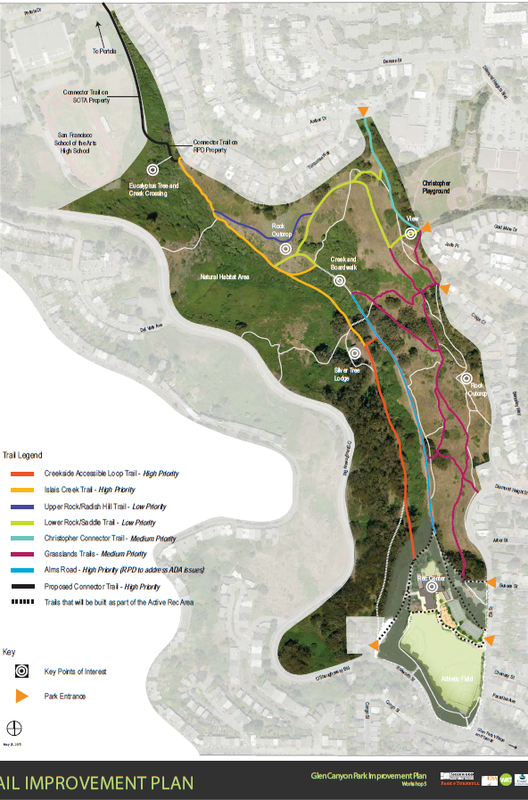 SF Recreation and Parks Department is stepping up the Trails project in Glen Canyon. By the time you read this, they may already have posted notices for removal of 31 trees that they say have been assessed as “Hazardous.” The trees can be removed any time from September 16, 2013. If they follow the map above, the hidden trail with the twisty willow trees on the west side of the creek will be a wide path possibly with bicycle access. We will be presenting a contract to the Rec and Park Commission Capital Committee on September 4 for approval of award and plan to mobilize soon after full Commission on September 16 pending approval.Tomorrow, August 16, we will be posting 31 trees adjacent to the trails that have been assessed as hazardous and are slated for removal. We are moving forward with posting trees as we would like for hazardous tree mitigation to be done before the end of the year to avoid disruption to nesting birds. Please see attached for a sample of the tree removal notices that we’ll be posting.For more information and details, please visit the project page of our website. Please contact me at any time with questions or suggestions. 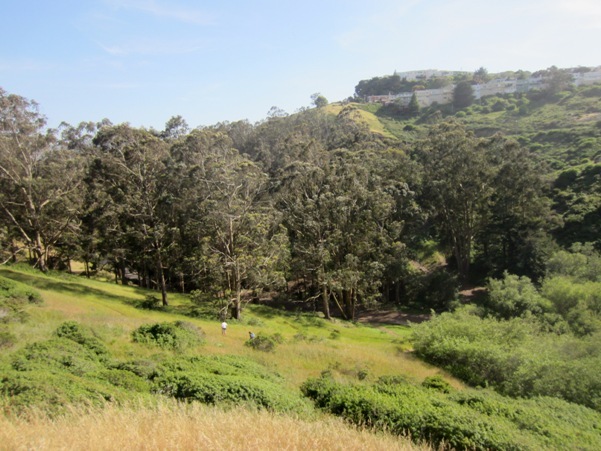 This tree has been assessed as hazardous as part of the upcoming Trails Improvement Project at Glen Canyon Park, and is slated to be removed. The project was vetted extensively through the community and includes trailside restoration planting. Removal will not take place before September 16, 2013. Vandals again. There goes some of the uniqueness of our Canyon. Can’t we please fire all of them?